Mariah Jordan Sharpe, representing the Colorado River Indian Tribes, (CRIT) was crowned Miss Indian Arizona, 2017-18 on October 14, 2017. She is the daughter of Chaweka Fisher and Isaac Sharpe, an enrolled member of CRIT and is of Mohave and Chemehuevi descent. Currently Mariah resides in Phoenix, Arizona where she attends Paradise Valley Community College, pursuing a degree in health and wellness. Her goal is to continue her education at the University of Hawaii to complete her bachelor’s degree. Mariah also won the Best Evening Wear, Oral Presentation, Essay, and Community Service Awards. River, golfing and learning traditional stories and songs from her elders. Mariah will now face a rigorous year of travel to many Arizona Indian reservations and special appearances at various schools, pow-wows and other state events. She will also travel to several out of state events. In addition to this schedule she is expected to maintain her school attendance which will be very challenging. The Miss Indian Arizona Association’s philosophy is that education is a very high priority. Kaelia Mae Nash from the San Carlos Apache Tribe was selected 1st Attendant to Miss Indian Arizona. She is the 18 year old daughter of Shalenia Chee and Waylon Nash. Kaelia is currently a student at Grand Canyon University and enjoys playing basketball, hiking and camping. Kaelia also won the Best Talent Award and was selected as Miss Congeniality by the other participants. 2nd Attendant to Miss Indian Arizona is Lexie Michael James from the Hopi Tribe. She is the 21 year old daughter of Jacqueline James. Lexie is currently employed as a Youth Liaison with the Hopi Foundation. She attends Northland Pioneer College where she is concentrating on a degree in Law and Criminal Justice. The People’s Choice award went to Daryan Villegas from the Tohono O’odham Nation. Elders being honored by the participants: Rose Chewing, 96 years old, Navajo: Tonita Hamilton, 81 years old, Hopi: Agatha Thompson, deceased, San Carlos Apache: Johnny Hill, 65 years old, Chemehuevi and Stanley Liston, 79 years old, Tohono O’Odham. 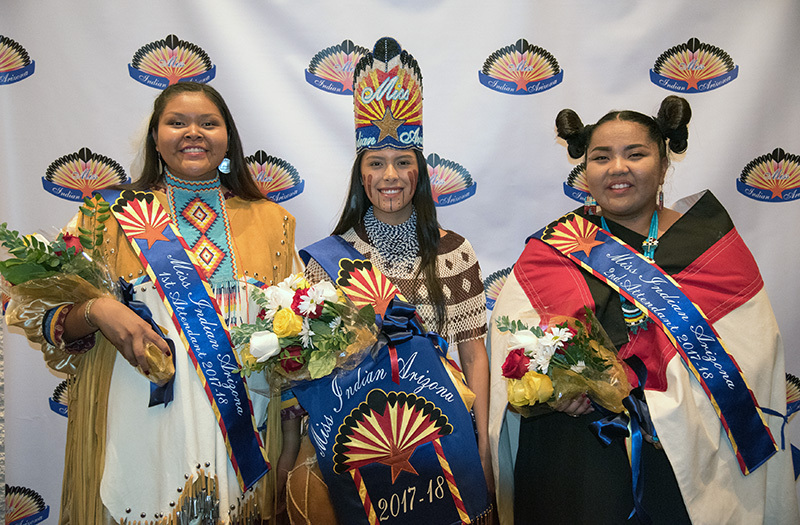 The Miss Indian Arizona Association congratulates all the winners and extents sincere thanks to all the participants and their parents.